Our first annual Harvest Dinner was a success! Some of our workers came, as well as friends from nearby towns. 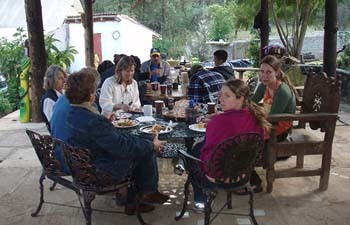 We successfully cooked a turkey by the fire and had a variety of dishes utilizing our autumn harvest. Particularly well represented this year are our squash and pumpkins, carrots, and salad greens– delicious! The kiddos loved the new trampoline. And we found that Jenga is a great game to play with people who don’t share a common language! Nighttime got a bit chilly, but we all chatted around the fire pit - the chilliness made it feel a bit more like fall for the folks who come from northern areas. Special thanks to the folks at the nearby Rancho for the amazing apple strudel, and to Michelle for bringing a pumpkin pie and a dish to pass! El día de los muertos, or Day of the Dead, is a Mexican holiday that brings a large amount of tourists to this area of Michoacán. Locals here build altars, or ofrendas, in honor of family members or friends who have died. The altars often contain food and drink for the dead loved ones. Around this area some people stay up all night with candles at the graves of those who have passed. It is interesting to observe this holiday. 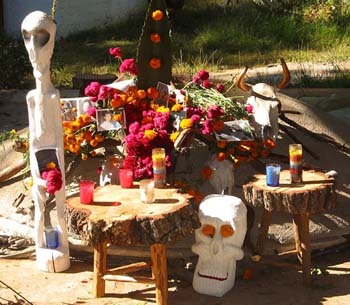 In the past, visitors here at the Bosque have made their own small ofrenda to take to the cemetery in Erongarícuaro. There is a small spot that foreigners and other folks who have no grave to sit by can gather with their altar to loved ones who have died. 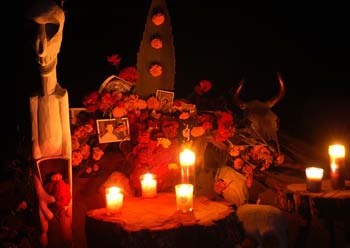 This year we had a few visitors and decided to make our ofrenda here at the Bosque. We used wood carvings, steer skulls, a maguey leaf, pata de león (lion’s foot flower), marigolds, and candles to create our shared ofrenda. On our ofrenda we placed pictures of the friends, family, pets, and body parts (!) we had collectively lost during the year. There was a 14-year-old man’s best friend who passed away here at the Bosque, a young nurse who died in the war in Iraq, a best friend lost to lung cancer, and a testicle lost to testicular cancer. While our ofrenda was not traditional, it served its purpose to those who used it as a tool to remember and celebrate the family and friends we had lost during the year. At night, after we returned from visiting some of the local cemeteries nearby, we sat at our ofrenda in reflection. You are currently browsing the News and thoughts from the Bosque Village weblog archives for November, 2007.